I am trying out RubyMine to see if we should use it on our Rails 3.2 app. 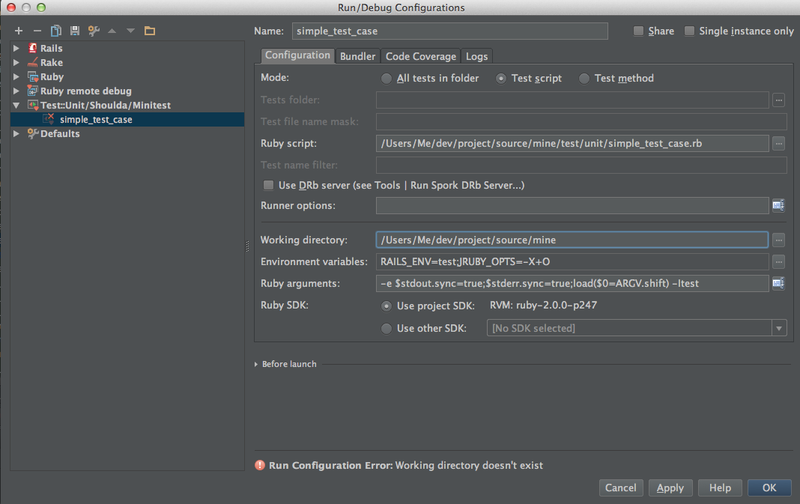 I am trying to run one of our unit tests under RubyMine's debugger without success. I have created a configuration for one of our unit test files (I have tried checking the "Run the script in context of the bundle exec" checkbox to no avail). When I set a breakpoint and hit the "Debug" button, this is what I see in the console. The breakpoing never fires (in the console output you'll see: "RuntimeError: Debugger.start is not called yet."). Thus far I am not able to debug *any* part of our app with RubyMine. Any help would be much appreciated. I am still running into issues but the change that allowed me to at least be able to stop at breakpoints was a simple change to my Gemfile. From what I've been able to find on the web, you are better off disabling any debugger related gems when running under RubyMine. Again, this change at least got me up and running. Hope it helps someone else.